If you’re a frequent reader of my blog and follow me on Instagram, you know that I always love to follow along with Disney Family’s fun #DisneyWeekend themes! This weekend, it’s all about Winnie the Pooh, so of course I had to make some healthy, Winnie the Pooh inspired treats! 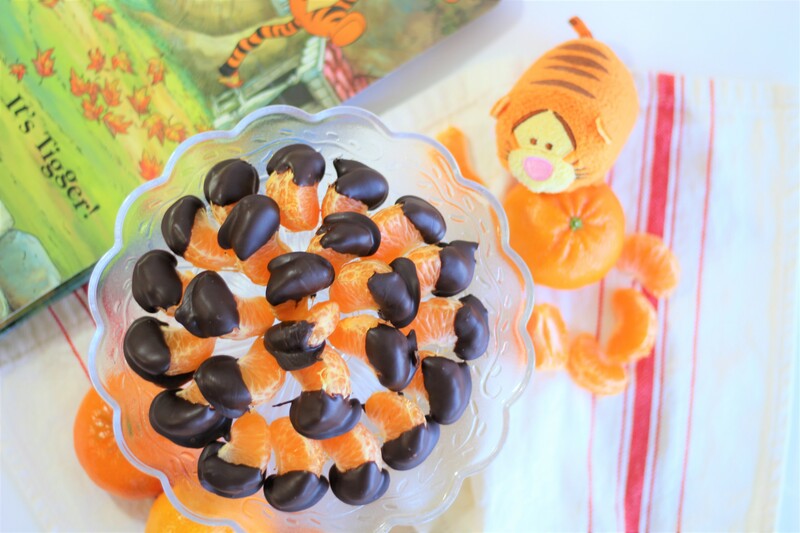 I made a brand new, very simple recipe that is great to make with children: Tigger Tails (recipe below)! And paired it with another healthy Winnie the Pooh treat, my Winnie the Pooh vegan smoothie (recipe here). Peel your oranges, and pull the slices apart. Break apart your block of chocolate and mix with oil, either placing in the microwave for 50 seconds (stirring at 25 seconds), or melting on the stove top. Dip your orange slices in chocolate, and place on parchment paper. Place in the refrigerator to solidify for 20 minutes. Keep refrigerated until you consume.